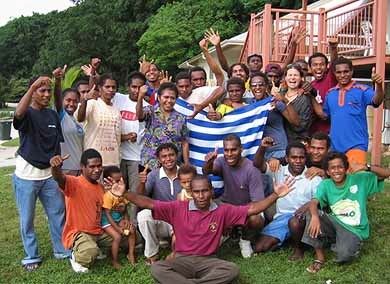 The news that 42 of the 43 West Papuans, who sailed from Merauke in West Papua to Weipa in Queensland in their traditional longboat with outriggers in January 2006, had received their visas to stay in Austrlia, caused them great joy on Christmas Island when they received the news two months later, in March 2006. Click here or on the image for more news and background information about this issue. The recent fury of Indonesia in reaction to the acceptance by Australia of 42 refugees who fled West Papua has a background to which Australia has been a party of several decades. Below is an outline of some of the issues playing out in this context. There's material previously published in New Matilda, observations by John Pilger, and editorials from The Age and from the Sydney Morning Herald. "The co-operative military agreement [between Indonesia and Australia] may well have the consequence of supporting hard-line military elements against the more moderate elements of Indonesian society. It will not improve the military's human rights abuses but legitimise them." "West Papuans argue that they suffer the environmental consequences [of the Grasberg Mining Operations] but do not receive revenue from the mine, and that human rights abuses are regularly committed by the Indonesian forces that act as security for the company." 23 April 2006: TAPOL Human Rights Bulletin 181 (West Papua) - It seems that since December 2005 things are starting to escalate around West Papua, so it's not surprising that TAPOL dedicates a large section of this December Bulletin to the issues in Papua. 10 April 2006: Pieter J Drooglever, An Act of Free Choice? - the Papuans of Western New Guinea and the limitations of the right to self determination. An English summary of the Dutch Government-commissioned report into the handover of Irian Jaya to the UN under the New York Agreement in 1962 and the Indonesian - and stacked - Referendum of 1969. 4 February 2006: Rallying for the Papuans - Photo Reports from around Australia - Within a week of the 43 Papuans arriving near Weipa in Queensland, Australians voted with their feet, and rallies were held in several states. Here are the photos from Melbourne, Sydney, Darwin, as well as some images taken on Christmas Island. 31 January 2006: Free West Papua, Let Them Stay! - A forum in Fremantle about the West Papuan asylum seekers and their reasons for the trip from Merauke to Weipa in Queensland with Senator Kerry Nettle, advocate Kaye Bernard, Project SafeCom's Jack Smit and Australian West Papua Association supporter Ned Byrne. 22 January 2006: Inside the Grasberg Mine: an exasperating New York Times key feature investigation on West Papua's Freeport Mine. Published in December 2005, the article is already found on dozens of locations on the internet, and perhaps it's a study that will break the stranglehold on a situation that's both environmentally unsustainable, politically corrupt and an abhorrence in terms of human rights and ecological responsibility. 21 January 2006: Raise the Flag and Cry Merdeka - The first traditional Papuan boat, a canoe with outriggers, arrived on Australian shores this week from West Papua. The heat is on the Howard government especially because the Indonesian government allegedly embarked upon "revenge attacks" against family members of those who made the journey. This is a background briefing on the issues at stake. In 1993, I and four others travelled clandestinely across East Timor to gather evidence of the genocide committed by the Indonesian dictatorship. Such was the depth of silence about this tiny country that the only map I could find before I set out was one with blank spaces stamped "Relief Data Incomplete". Yet few places had been as defiled and abused by murderous forces. Not even Pol Pot had succeeded in despatching, proportionally, as many people as the Indonesian tyrant Suharto had done in collusion with the "international community". In East Timor, I found a country littered with graves, their black crosses crowding the eye: crosses on peaks, crosses in tiers on the hillsides, crosses beside the road. They announced the murder of entire communities, from babies to the elderly. In 2000, when the East Timorese, displaying a collective act of courage with few historical parallels, finally won their freedom, the United Nations set up a truth commission; on 24 January, its 2,500 pages were published. I have never read anything like it. Using mostly official documents, it recounts in painful detail the entire disgrace of East Timor's blood sacrifice. It says that 180,000 East Timorese were killed by Indonesian troops or died from enforced starvation. It describes the "primary roles" in this carnage of the governments of the United States, Britain and Australia. America's "political and military support were fundamental" in crimes that ranged from "mass executions to forced resettlements, sexual and other horrific forms of torture as well as abse against children". Britain, a co-conspirator in the invasion, was the main arms supplier. If you want to see through the smokescreen currently around Iraq, and understand true terrorism, read this document. As I read it, my mind went back to the letters Foreign Office officials wrote to concerned members of the public and MPs following the showing of my film Death of a Nation. Knowing the truth, they denied that British-supplied Hawk jets were blowing straw-roofed villages to bits and that British-supplied Heckler and Koch machine-guns were finishing off the occupants. They even lied about the scale of suffering. And it is all happening again, wrapped in the same silence and with the "international community" playing the same part as backer and beneficiary of the crushing of a defenceless people. Indonesia's brutal occupation of West Papua, a vast, resource-rich province - stolen from its people, like East Timor - is one of the great secrets of our time. Recently, the Australian minister of "communications", Senator Helen Coonan, failed to place it on the map of her own region, as if it did not exist. An estimated 100,000 Papuans, or 10 per cent of the population, have been killed by the Indonesian military. This is a fraction of the true figure, according to refugees. In January, 43 West Papuans reached Australia's north coast after a hazardous six-week journey in a dugout. They had no food, and had dribbled their last fresh water into their children's mouths. "We knew," said Herman Wainggai, the leader, "that if the Indonesian military had caught us, most of us would have died. They treat West Papuans like animals. They kill us like animals. They have created militias and jihadis to do just that. It is the same as East Timor." For over a year, an estimated 6,000 people have been hiding in dense jungle after their villages and crops were destroyed by Indonesian special forces. Raising the West Papuan flag is "treason". Two men are serving 15 and ten-year sentences for merely trying. Following an attack on one village, a man was presented as an "example" and petrol poured over him and his hair set alight. When the Netherlands gave Indonesia its independence in 1949, it argued that West Papua was a separate geographic and ethnic entity with a distinctive national character. A report published last November by the Institute of Netherlands History in The Hague revealed that the Dutch had secretly recognised the "unmistakable beginning of the formation of a Papuan state", but were bullied by the administration of John F Kennedy to accept "temporary" Indonesian control over what a White House adviser called "a few thousand miles of cannibal land". The West Papuans were conned. The Dutch, Americans, British and Australians backed an "Act of Free Choice" ostensibly run by the UN. The movements of a UN monitoring team of 25 were restricted by the Indonesian military and they were denied interpreters. In 1969, out of a population of 800,000, some 1,000 West Papuans "voted". All were selected by the Indonesians. At gunpoint, they "agreed" to remain under the rule of General Suharto - who had seized power in 1965 in what the CIA later described as "one of the worst mass murders of the late 20th century". In 1981, the Tribunal on Human Rights in West Papua, held in exile, heard from Eliezer Bonay, Indonesia's first governor of the province, that approximately 30,000 West Papuans had been murdered during 1963-69. Little of this was reported in the west. The silence of the "international community" is explained by the fabulous wealth of West Papua. In November 1967, soon after Suharto had consolidated his seizure of power, the Time-Life Corporation sponsored an extraordinary conference in Geneva. The participants included the most powerful capitalists in the world, led by the banker David Rockefeller. Sitting opposite them were Suharto's men, known as the "Berkeley mafia", as several had enjoyed US government scholarships to the University of California at Berkeley. Over three days, the Indonesian economy was carved up, sector by sector. An American and European consortium was handed West Papua's nickel; American, Japanese and French companies got its forests. However, the prize - the world's largest gold reserve and third-largest copper deposit, literally a mountain of copper and gold - went to the US mining giant Freeport-McMoran. On the board is Henry Kissinger, who, as US secretary of state, gave the "green light" to Suharto to invade East Timor, says the Dutch report. Freeport is today probably the biggest single source of revenue for the Indonesian regime: the company is said to have handed Jakarta 33 billion dollars between 1992 and 2004. Little of this has reached the people of West Papua. Last December, 55 people reportedly starved to death in the district of Yahukimo. The Jakarta Post noted the "horrible irony" of hunger in such an "immensely rich" province. According to the World Bank, "38 per cent of Papua's population is living in poverty, more than double the national average". The Freeport mines are guarded by Indonesia's special forces, who are among the world's most seasoned terrorists, as their documented crimes in East Timor demonstrate. Known as Kopassus, they have been armed by the British and trained by the Australians. Last December, the Howard government in Canberra announced that it would resume "co-operation" with Kopassus at the Australian SAS base near Perth. In an inversion of the truth, the then Australian defence minister, Senator Robert Hill, described Kopassus as having "the most effective capability to respond to a counter-hijack or hostage recovery threat". The files of human-rights organisations overflow with evidence of Kopassus's terrorism. On 6 July 1998, on the West Papuan island of Biak, just north of Australia, special forces massacred more than 100 people, most of them women. However, the Indonesian military has not been able to crush the popular Free Papua Movement (OPM). Since 1965, almost alone, the OPM has reminded the Indonesians, often audaciously, that they are invaders. In the past two months, the resistance has caused the Indonesians to rush more troops to West Papua. Two British-supplied Tactica armoured personnel carriers fitted with water cannon have arrived from Jakarta. These were first delivered during the late Robin Cook's "ethical dimension" in foreign policy. Hawk fighter-bombers, made by BAE Systems, have been used against West Papuan villages. The fate of the 43 asylum-seekers in Australia is precarious. In contravention of international law, the Howard government has moved them from the mainland to Christmas Island, which is part of an Australian "exclusion zone" for refugees. We should watch carefully what happens to these people. If the history of human rights is not the history of great power's impunity, the UN must return to West Papua, as it did finally to East Timor. Or do we always have to wait for the crosses to multiply? When protesters killed five members of the Indonesian security forces in the remote and restive province of Papua last week, it focused international attention on a region with long-standing grievances. Analysts are warning that the Indonesian government has a limited window of opportunity to do something about the unrest. Although the demonstrations were nominally spurred by objections to the world's largest copper and gold mine, operated by the US-based Freeport McMoRan, the roots of Papuan discontent are deeper and more intractable. Papua has a distinct identity and political history. Dutch colonial forces granted Papua self-rule in 1961, but after the Dutch pulled out a year later, Jakarta annexed the province without honouring the agreement. In 2001, the government recognised this by granting the province increased autonomy, but it has had little tangible benefit on the ground. Losing faith in the political process, many activists believe direct action is the only way to bring their concerns to the attention of Jakarta. "Many of the demonstrations had long been planned by student groups linked to the independence movement, but the Freeport protests also reflected broader frustration and anger over the role of the military in Papua, lack of justice for past abuses and the failure of special autonomy to improve the welfare of the people," the Brussels-based International Crisis Group said in a report released this week. The list of Papuan complaints has been growing steadily over the years. People in the province feel that at best they are neglected, and at worst they have been ruthlessly exploited by successive Jakarta governments only interested in taking their gold, their copper, their timber and their land and giving nothing in return. The brutal and heavy handed tactics of the Indonesian security forces and the lack of any reliable system of redress have also provided a constant source of aggravation, and a constant source of recruits to the ranks of the rebels. The authorities are aware of the problem and have taken some steps: after the recent police deaths, they took away the guns of 40 members of the paramilitary mobile police brigade to prevent retribution. Papuans also feel let down by the government of President Susilo Bambang Yudhoyono. In his election campaign in 2004, Mr Yudhoyono promised to tackle long-standing Papuan concerns, a promise that won him an overwhelming share of the vote in the province. But Papuans say he has not delivered. They say his administration has ignored the Papuan People's Council, which was set up late last year as an interlocutor to ease tensions between Papuans and the central government. They say that they are tired of waiting for change that never comes and that now is the time to for them to push it onto the agenda, both within Indonesia and internationally. Papuan nationalists are becoming much more adept at attracting international attention to their concerns. They know that the topic of gold mining, with its visceral if frequently mistaken associations with rapacious greed, has a broad and incendiary appeal in the liberal West. By coupling their economic grievances with Freeport with accusations of environmental damage, the appeal has been given extra impetus. A prominent Papuan nationalist, Edison Waromi, says that the recent arrival of 43 Papuan asylum seekers in Australia was designed to bring attention to the problems in the province. The boat they arrived on carried a banner saying in English: "Save West Papua people souls from genocide, intimidation and terrorist from military government of Indonesia." On Thursday, the Australian government granted all but one of the group temporary protection visas, an indication that their fears of the Indonesian authorities may have foundation. It is a clear embarrassment for South East Asia's largest democracy and a country that is trying to re-establish its humanitarian credentials after years of repression. Beneath Indonesia's newly restored democracy runs a powerful vein of nationalism. What the nationalists fear is that Papua will become another East Timor. After almost a quarter of a century of Indonesian rule, international pressure forced Jakarta to hold a referendum on Timorese independence, and in 1999 the land that Indonesians once called their 27th province voted to break away, leaving a deep wound that for many has never healed. Nationalists accuse the West of orchestrating the plan to "steal" East Timor, starting with a mass campaign by human rights activists and ending with the UN-organised referendum on independence. The subject is still so raw that almost all visiting dignitaries, from US Secretary of State Condoleezza Rice earlier this month to UK Prime Minister Tony Blair next week, are required to make a statement that they are committed to "the unitary state of Indonesia" - shorthand for a declaration that they don't support independence for Papua or any other part of the country. The Indonesian government has to perform a difficult balancing act in many dimensions. It needs to move towards addressing Papuan concerns while trying to keep inflamed Indonesian nationalist sentiments in check; and it needs to be seen to be taking concerns over Freeport into account while avoiding being seen unilaterally to renegotiate the company's licence, and thus alienating vital foreign investment in the country. Although the government has been tinkering with solutions to specific Freeport-based issues, it has done little to address the underlying sources of discontent in Papua. The International Crisis Group says that the most important element of any solution would be constructive dialogue with a representative Papuan body. It says that although it would currently be possible to revive the Papuan People's Council as a dialogue partner, people are running out of patience, and that will not hold true indefinitely. In February, a month before the Department of Immigration issued temporary protection visas to 42 West Papuans, Australia's Foreign Minister Alexander Downer went to Jakarta for discussions with his Indonesian counterpart Hassan Wirajuda. He explained that the Department of Immigration's forthcoming decision would be constrained by international law and treaty obligations, and did not reflect Australia's foreign policy towards Indonesia. Downer reiterated Australia's support for Indonesian sovereignty over West Papua and for President Yudhoyono's 'special autonomy' package for the province. The Ambassador went on to ask whether 'those whose raison d'être was East Timor' had simply adopted the cause of West Papua. According to a report in the Daily Telegraph on 10 March, Ambassador Richardson's remarks were so supportive that Indonesia's Ambassador to the US, who was also present at the meeting, joked that he may soon be out of a job. In fact, there is truth to Richardson's assertion that many of the same people who were involved in East Timor are now instrumental in what is happening in West Papua - but in ways that Australia's diplomats may not want publicised. One such person is Indonesia's current Ambassador to the US, S Parnohadiningrat, who was secretary of the Indonesian Task Force for the ballot in East Timor in 1999. The debacle that ensued left Indonesia's international reputation in tatters. Another is Mahidin Simbolon, the military commander now in charge of West Papua, who was previously deputy commander of the military region that included East Timor. Simbolon served at least six tours of duty in East Timor. He led the operation to capture Xanana Gusmao in 1992 and was a key actor in the Indonesian military's campaign of State-sponsored terror against the East Timorese people. In 2001, Simbolon was promoted to Major General and given command of West Papua. The same militia terror tactics from East Timor began to be employed there soon afterwards. Even the US-Indonesia Society was established after the Dili Massacre in order to counter the challenge posed by the East Timor solidarity movement in the US. But it was unable to mount a successful defence of the Indonesian military's human rights record because every time it argued that improvements were being made, events on the ground proved otherwise. The Indonesian Military (TNI) is still coming to terms with its loss of power in a democratising Indonesia. In the post-Suharto era, it is locked in a struggle for supremacy with the civilian authorities. Since coming to power in 2004, President Yudhoyono's actions indicate that he is trying to bring the TNI more firmly under civilian authority: he replaced the hardliner Ryamizard Ryacudu with the more moderate Djoko Santoso as Army Chief of Staff, and promoted his classmates from the Class of 1973 and his brothers-in-law, Erwin Sujono and Pramono Edhie Wibowo, to senior military positions, indicating his desire to have trusted personnel in key positions. President Yudhoyono's 'war on illegal logging' should also be understood in the context of his determination to end the military's network of illegal businesses. The TNI still receives only 30 per cent of its budget from the Government, with the rest coming from its network of legal and illegal businesses. The remote and resource-rich West Papua - where the military runs illegal businesses such as logging and human, arms and drug trafficking, and is building up troops and raising militias to terrorise the population - provides a significant source of income. In this sense, West Papua is a test case for Indonesia's democratic transition. Australia's plans to strengthen its defence engagement with Indonesia in the form of joint exercises and training is a blow to this process. This co-operative military agreement may well have the consequence - whatever the intention - of supporting hard-line military elements against the more moderate elements of Indonesian society. It will not improve the military's human rights abuses but legitimise them. An alternative would be to openly declare that the Indonesian military is not under civilian authority, and that there will be no military ties until things have changed. 'Sam' is a West Papuan who lives and studies in Melbourne. Before coming to Australia he was heavily involved in student activism against the Indonesian military's role in West Papua, and is still in contact with student activists at Cenderawasih University campus in Abepura, on the outskirts of the capital Jayapura, where the latest clash between police and Papuans took place on 16 March. 'I went to jail for six months for protesting against Indonesia's role in West Papua,' he says. Although there has been no official confirmation of deaths, according to Sam's contacts, six West Papuans have died since the 16 March clash, and as many as 150 were injured, including high school students. Late last week Democrats Senator Natasha Stott Despoja told reporters she had received information from a 'reliable source' in West Papua of 16 deaths in reprisal attacks after the protests. This week Alex Rayfield from the Australia West Papua Association also received independent reports that 16 people have been disappeared, and there are grave concerns for another 75-80 who are in jail. The deaths have not been confirmed. Since late February, there have been a number of protests by West Papuan civil society groups and students demanding the closure of the Freeport-McMoRan mining operations around Timika in the south of West Papua, which include the world's largest gold and copper mine, Grasberg. West Papuans argue that they suffer the environmental consequences but do not receive revenue from the mine, and that human rights abuses are regularly committed by the Indonesian forces that act as security for the company. On 16 March protestors gathered near Cenderawasih University, where they felled coconut palms and piled up tyres to block the Abepura-Sentani highway. The Indonesian Police Mobile Brigade (Brimob) moved in to remove the blockade, and a violent confrontation broke out. Rayfield has had contact with a number of people in the area, since the protests. 'My sources say that there was someone in the crowd who threw a rock. Then the police opened fire, and that's when the crowd turned,' he said. Three police officers and a soldier were killed. Locals say reprisal attacks by the police began immediately. Rayfield was told by one source that police had talked about 'hunting West Papuans down' -- regardless of whether they were present at the protest. Since the protests, Rayfield has received phone calls and text messages from a number of witnesses and victims, including information that Albert Rumbekwan, a local human rights lawyer, was intimidated by police and asked not to investigate the incident. The staff of West Papuan human rights watchdog, Elsham, who were monitoring the demonstration were searched and their movements have been limited through fear of arrest and detention. One text message listed eight student accommodation dorms that had been raided by police. They are: Nayak, Nimig, Mimika, Cemo, Uncen (unit 6), Kinaonak, Maro and Moni. Last night Rayfield received a text message that said a student had just been shot dead. 'This is similar to the Abepura case in 2000,' he says, 'when one Brimob was killed [in an attack on the Abepura police station] and they went on a revenge attack, arrested or tortured over one hundred students, killed three in detention and another later died.' (Read New Matilda's coverage of the case here). According to Sam, those involved in the protest on 16 March had three main demands: that the Freeport-McMoRan mine be closed until an agreement is drawn up between the mine operators and the West Papuan people; that all combat troops be withdrawn from West Papua; and that a dialogue take place about the controversial Act of Free Choice (under which Indonesia was handed control of the province), with third party negotiators. '[Protestors believe that] if they shut down Freeport-McMoRan there will be no money to support the military to enable all the other mining and human rights abuses,' says Sam. They also want to draw attention to the fact that Indonesia signed the contract for Freeport-McMoRan to mine in West Papua in 1962, a year before it had official control of the territory. West Papua was colonised by the Netherlands in the 19th century and incorporated as part of the Dutch East Indies. But Dutch sovereignty was not relinquished at the same time as the rest of the archipelago, which gained independence as the Republic of Indonesia in 1949. Under this agreement, administration of West Papua was officially handed to Indonesia the year after, with the provision that Indonesia would hold a referendum after a period of six years in which the people of West Papua would vote on whether to integrate. The referendum, known as the Act of Free Choice (but later dubbed the 'Act of No Choice'), was held in 1969, under questionable circumstances. Only 1022 of the 800,000-strong population were permitted to vote -- ostensibly as community representatives -- and it is now widely understood that the selected voters were coerced, threatened and closely scrutinised by armed Indonesian security personnel to unanimously vote for integration with Indonesia. West Papuans argue that their integration with Indonesia was a denial of their fundamental right to self-determination. John Rumbiak is a West Papuan human rights investigator who has worked tirelessly to uncover abuses undertaken by the Indonesian military in West Papua. In an interview in 2003, Rumbiak explained that Papuans claim the whole process of transferal to Indonesian control was fraudulent. 'However, the Indonesian Government claims that it's over -- that Papua is an integral part of Indonesia -- [and their] stand is supported by the international community, regardless of the fraudulent process,' he said. President of Indonesia Susilo Bambang Yudhoyono has accused pro-independence activists in West Papua of hijacking what is essentially a local grievance with Freeport-McMoRan, and using the recent protests to undermine Indonesia's territorial integrity. People were protesting for one day and no one noticed or responded. So on the second day they were frustrated. Then instead of sending in the authorities to negotiate, they sent Brimob. Frustration was what caused [the violence]. Meanwhile, as reprisal attacks continue, hundreds of West Papuan students are reportedly still hiding in the jungles outside Jayapura in fear for their lives. Because local human rights watch organisations are being intimidated, West Papuans are calling for an independent, international investigation into the situation. Marni Cordell is Associate Editor of New Matilda. THE strengthening relationship between Australia and Indonesia is turning prickly again. As the old joke about relations between consenting porcupines goes, both nations will have to proceed with great care. At this stage, neither country can risk misunderstanding about each other's position, nor hold false illusions about what is possible. Despite Australian assurances of unqualified support for Indonesia's territorial integrity, the angry reaction in Jakarta to Australia's granting of temporary protection visas to 42 asylum seekers from West Papua reflects a belief that the decision helps promote a separatist agenda. And it will, regardless of the merits of the decision. The Papuans' asylum bids were made, not coincidentally, as arrangements for a political settlement based on special autonomy for the province face collapse. With West Papua being freely described as "another East Timor" - though not by any Australian Government representative - Indonesia is sensitive to the merest hint of a shift in Australia's position. Yesterday, Indonesia recalled its ambassador in protest at the granting of visas. An official statement said the decision was "baseless" and would confirm many Indonesians' suspicions about Australians' separatist sympathies. The Immigration Department did not allow political pressure to sway its deliberations and deserves congratulation for acting on its legal obligations. As Immigration Minister Amanda Vanstone said, findings of a "well-founded fear of persecution" were based on case-by-case tests of the claims. Even as Foreign Minister Alexander Downer sought to mend fences, he conceded "historically, there have been abuses". When President Susilo Bambang Yudhoyono called Prime Minister John Howard to guarantee that the Papuans would not be harmed if Australia returned them, it is unlikely his good faith was doubted. There is doubt, however, about the extent to which Indonesia's elected leaders can rein in the powerful military, the TNI, when separatist sentiment stirs in its far-flung provinces. Indonesia's discomfort about this does not alter the need to help Dr Yudhoyono bring the TNI under the full authority of civilian government. Until then, Australia has to be cautious about how the two countries' security forces work together. The goal must be to reward political reform, rather than tacitly condone abuses by the TNI. In West Papua, a security build-up preceded deadly protests last week, centring on the Freeport goldmine, which is seen as a symbol of exploitation of the resource-rich province. A West Papuan parliament was to debate the issue but is now in limbo. The International Crisis Group is warning that the Papuan People's Council is facing collapse and with it autonomy arrangements offered in 2001. As The Age's Mark Forbes reports from the provincial capital, Jayapura, up to 1000 protesters are in hiding. Some plan to flee to Australia. Hence Indonesia's warning that Australia's visa decision could open the floodgates. But this is a side issue to a greater priority, which is to resolve the underlying problem in West Papua, where poverty and separatist sentiment are an explosive mix. As Mr Downer said yesterday, Dr Yudhoyono has made a commitment to finding a political solution "consistent with the sort of settlement that he's been able to negotiate in Aceh", which was a laudable achievement last year in another province with a long-running separatist conflict. Mr Downer personally informed his Indonesian counterpart, Hassan Wirajuda, of the visa decisions, which a spokesman said was the "neighbourly" thing to do. It would be equally neighbourly of Australia to do its best to persuade Indonesia that a political settlement in West Papua is in everyone's interest. Some international mediation will probably be needed to rebuild trust and establish a dialogue between Jakarta and the Papuans, who saw the holding of elections this month in a hived-off area, West Irian Jaya, as a breach of the autonomy deal. This is not a pro-independence argument. As the International Crisis Group warns, West Papuan leaders "should move beyond non-negotiable demands and offer realistic policy options to make autonomy work". Neither a settlement nor the Indonesia-Australia relationship can work without realistic acceptance of each other's problems and obligations. Australia cannot yield on human rights law, but it also must reassure Indonesia that it is keen to work together to avoid the bloodshed and division that "another East Timor" would bring. INDONESIA'S Foreign Ministry made a number of accurate points in its blast at Australia's decision to give temporary protection visas - in effect, political asylum - to 42 of the Papuans whose outrigger canoe landed in Australia in January. To some extent, the Howard Government's actions show double standards when compared with its stand during the Tampa episode. And yes, there are elements in Australia supporting Papua's detachment from Indonesia - quite a lot actually, even if few think it a likely prospect. But in this case, Australia's responsibilities under refugee treaties could not be fudged. The Papuans had made it directly to the Australian mainland as their first country of refuge. The 42 include the family of Thomas Wainggai, who died 10 years ago in a Jakarta prison serving a life sentence for raising the Papuan independence flag, making them lifelong "persons of interest" to security agencies. At present, there is more tension between Papuans and authorities, which started among panhandlers seeking gold from the giant Freeport mine's waste, and spread to the student body of Papua's main university. Regrettably, protesters killed four security men, inflaming the situation to the point where widespread reprisals are easy to envisage, despite Jakarta's assurances. Indeed, hundreds of students are said to have gone into hiding, or headed for the Papua New Guinea border. Whether the trickle into Australia and PNG turns into a flood depends mostly on how President Susilo Bambang Yudhoyono and his Government address the special case of Papua, which was fumbled by his three post-Soeharto predecessors. Having worked out a settlement to the 30-year Aceh conflict, Dr Yudhoyono might apply his evident peacemaking skills to the other end of the archipelago. This would be buttressed by his quiet efforts to reform the Indonesian military, which has played a harsh, extortionate role in Papua. Plans to cede more autonomy and resource revenue to Papua have been put up since Soeharto fell in 1998. But there has been backtracking, chiefly through schemes to split Papua into two or three provinces, and little sign of much new funding going to health services and education in the villages. If Jakarta worries about East Timor-style activism, Papuans worry about the arrival of East Timor-model militias. Naturally, Jakarta is hesitant about autonomy, fearing it will be taken as a floor rather than a ceiling. Papuan nationalism seems so deeply instilled in the population that it may be nurtured only by more welfare and greater self-rule. The sense of betrayal persists over the Indonesian-manipulated Act of Free Choice in 1969. With the Freeport mine, the Tangguh gas field, its sizeable oilfields, and the tropical hardwood being smuggled to China, a breakaway Papua would be viable enough. But where is the foreign support? Meanwhile, the record of PNG, the Solomon Islands, Fiji and Vanuatu is hardly an advertisement for Melanesian independence. Whatever its fears, a democratic Indonesia cannot go back to the Soeharto-era formula of tight military control, restricted access and population-engineering through the now-abandoned transmigration scheme. Nor can scrutiny be wished away. Friendly governments cannot crack down on peaceful criticism and advocacy. Jakarta must engage with the Papuan challenges, and openness will tend to bring out the best in Indonesia.